6.The coral stitches are combined with- Chain stitch, buttonhole stitch and herringbone stitch in these samples. 7.Three coral stitches are worked together with feather stitches in the first sample- [single coral stitch was not prominent]. Cretan stitch and coral stitches are alternated in the second sample, it varies from knotted cretan stitch in that the needle does not pass through the fabric in knotted Cretan stitch. I like this sample. 8.After working Algerian eye stitch variations in a line, coral stitch row is worked over them in the first sample, in the second sample , scroll stitch and coral stitch are alternated. 9.A row of coral stitch is worked over fly stitches in the first sample, arrow head stitches are worked over zigzag coral stitch in the second sample. 10.Detached chain stitches are worked on both sides of the coral stitch in the first sample, buttonhole stitch is worked over coral stitch in the second sample. 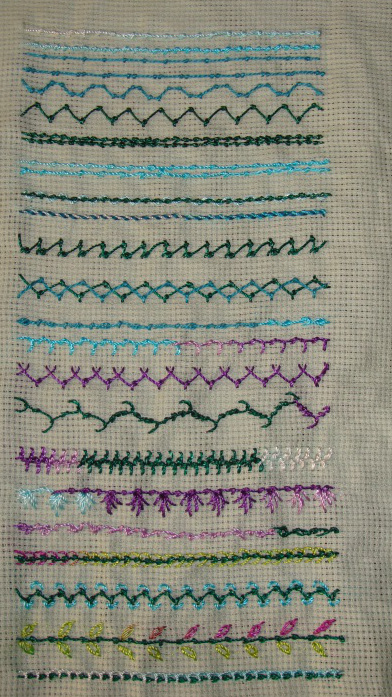 This was an easy stitch and can be combined with very many stitches, the knots will add beauty to any seam. I am catching up on some of the stitches which I did not work on when they were posted. 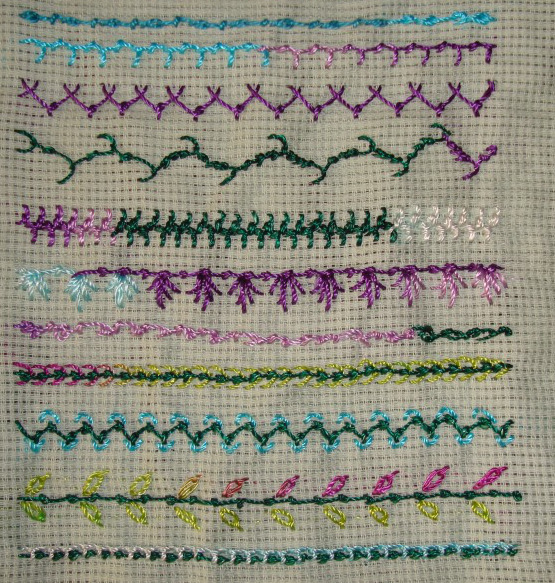 The 66th week stitch of the TAST 2013 stitch challenge by SharonB is coral stitch. 1.In the first row, I started working this stitch for the first time, the knots are closer in the second row and set afar in the third row. 2.Two knots are worked together with a space in between in the first row, I tried this stitch in a curve by working two knots on top and two knots at the bottom in the second row. 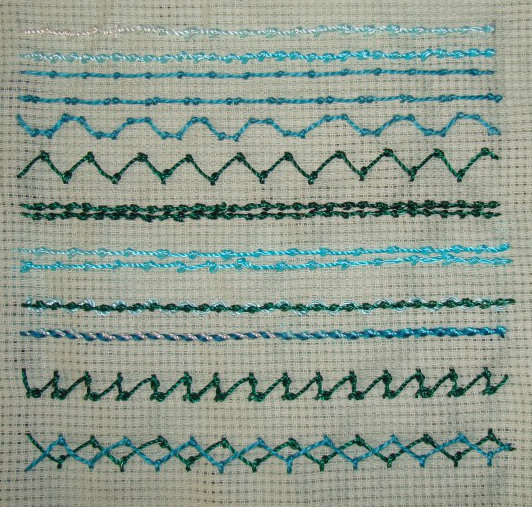 Zigzag coral stitch is worked in the third row. 3.Two rows coral stitches are worked together in two ways in these rows. 4.Coral stitch rows are laced and whipped in this sample. 5.I tried varying the zigzag coral stitch in the first row, zigzag coral stitches worked in two colours in the second row.